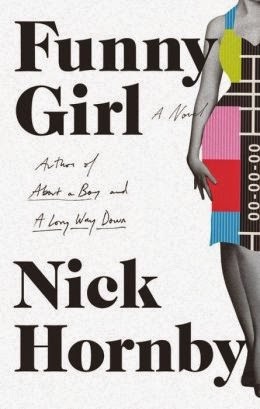 Nick Hornby fans, I think, will be pleased with his latest novel, Funny Girl, about a woman who becomes a TV comedy star in 1960s England. There is slapstick. There's wit. There's uber-Britishness. And, of course, there are scenes of absolutely hysterical dialogue. We follow young, comely Barbara as she leaves her small-town home to make it in show business in London. Barbara is a quit-witted Lucille Ball aficionado who enjoys messing with people who underestimate her comedy chops (or her intelligence) — think Amy Poehler reacting to mansplainers here. In one scene early in the novel, Barbara is on a "date" with a man who she is hoping to use to buy her a TV (she's broke, working at a fragrance counter in a department store, and desperately misses being able to watch I Love Lucy). Barbara and this philandering fellow are supposed to meet another couple, but everyone's shocked when the other guy shows up with his wife, instead of a young "date" like Barbara. There'd been some crossed signals about what type of night on the town this was supposed to be. Everyone's embarrassed, but Barbara decides to have fun with the awkwardness — pretending she doesn't know her date is married, and doing everything she can to make the scene as uncomfortable as she can for everyone involved, especially the other guy's wife. It's high comedy! One of the funniest scenes in the novel involves a table read with Sophie/Barbara and her leading man, a semi-famous British actor. The scene is about their wedding night, and the writers have decided to challenge convention for comedy, making the man a virgin and the woman not. But the leading actor takes exception — and after some hemming and hawing, he admits the reason he's uncomfortable with the scene is that he thinks he's too good-looking for the audience to believe he's a virgin. Indeed, this frequent blurring of the line between art and life — but for comic effect — is one of the strengths of the novel. My hesitancy to give this a full glowing review is that it's about 100 pages too long for a comedy novel — we spend a ton of time at the end catching up with all the characters years later. And it just seemed a bit superfluous. But for the most part, this is a funny, breezy read, which, as I said, long-time Hornby fans will definitely like. I thought the same thing about the length. The last part was unnecessary. Yeah - I wish it would've ended when the show ended.